Learn to weave a large basket! In this class we will make backpack basket for foraging, fishing, grocery shopping or any application where have a sturdy rigid backpack may be useful. Expand your design ideas by learning how to incorporate "windows", snake wraps, beads and decorative stitches to your pine needle basket designs. Get individual help with your own design. 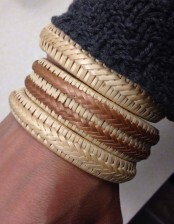 Bracelets are made from skeined willow wrapped over a pre-formed ring. Embellishment of hand skeined willow braid added to wrapped bracelet ring completes the project. Both natural (white) and buff (red-brown) willows skeines are used for the braid.